Rediscovre – RTW that works! Recovre’s leading edge approach to Redeployment. This service offering can be adopted across the workers compensation, income protection and CTP markets. The assessment phase which sets the foundation for the whole model. It also encompasses all the other modules as assessment should be an ongoing focus throughout the program. A comprehensive suite of redeployment services will be delivered based on an initial triage conducted of the client at the assessment phase. Depending on the individuals requirements they will be directed into the appropriate service on the redeployment continuum. Recovre Redeployment services will deliver a highly targeted range of services which are driven from a comprehensive assessment and triage process. Recovre’s assessment/triage approach takes into consideration the individuals skills and capacity along with any identified barriers. Following the assessment an individualised program is implemented considering a number of module options. The modules are selected based on the identified RTW barriers and the needs of the individual with the focus on achieving the outcome quickly. The modules do not need to be provided in a linear manner. The modules are not designed to be linear in their process but can be conducted concurrently or modules excluded depending on candidate needs. Recovre will be a strong partner to organisations wishing to improve the return to work outcomes of job detached employees. 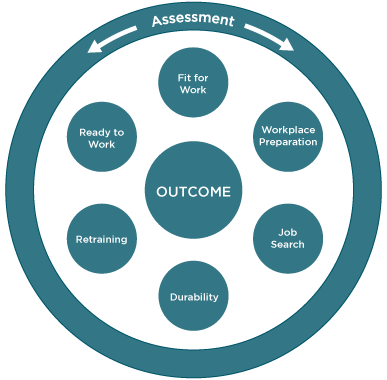 If your organisation demands transformational results in the return to work outcomes of redeployment candidates then Rediscovre the RTW services from Recovre.